You may remember my post about the vegan tea party I had in September from a few weeks ago… Well, the chocolate and red wine drip cake was not the only one I had baked for that day! I also felt inspired to try out a vegan version of a snickers cheesecake: including peanuts, biscuit base, caramel and chocolate, just as it’s supposed to be. Oh and peanut butter (my favourite!) of course! 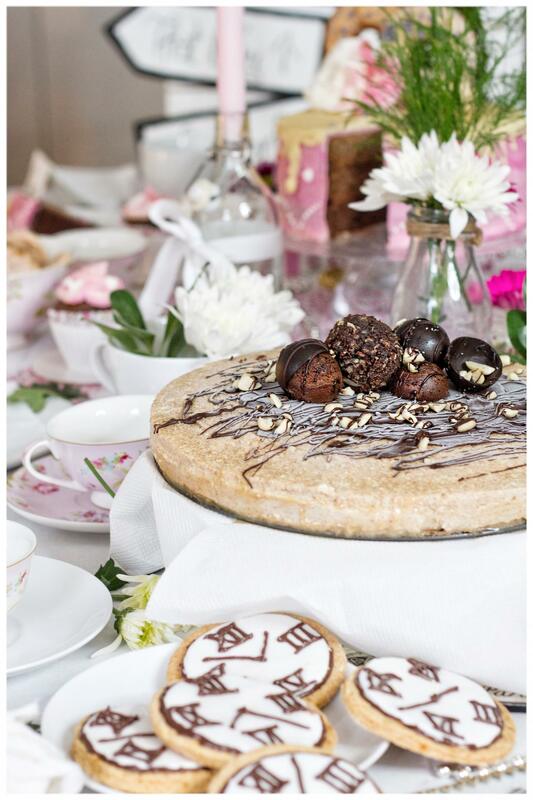 Of course the additional chocolate & brownie ball decorations on the top are absolutely optional – as I prepared this for a tea party though, I wanted to make it look extra ‘pretty’. I hope I did okay for the first attempt at this kind of decoration. As you can see being vegan you really don’t need to miss out on any flavours thay you love – but you gain a much healthier and cruelty version of your favourite tastes. 1. Prepare the cake base by crumbling up the digestives into your blender. Pulse them until all biscuits are crumbled up. 2. Melt the butter and add to a large bowl with the digestives. 3. Spread the mix in a 25cm diameter cake pan and use your hands to press it against the tin bottom and a bit on the side. 4. Set the mix into the oven for about 10 minutes at 150 degrees. Set aside to cool once done. 5. Puree the cashews, then in a bowl combine the silken tofu with the peanut butter, agar agar and the vanilla extract. If you like your cheesecake sweet, add some agave nectar to the mix. 6. Crush half of the peanuts and spread them on the cake base together with the rest of the peanuts. 7. Add the sugar and water to a smapp saucepan. Bring to a boil and then lower the heat until the mix gets a nice goldenbrown colour and thickens to a caramel. 8. Spread the caramel on the peanuts, then add the peanut cheesecake mix. Set the mix into the freezer for 15 mins after. 9. Melt the chocolate and spread it on top, set the cake back into the freezer for 30 mins after.